Taupo rivers have been extremely busy over the Easter weekend especially with school holidays out and family’s wanting to get a few days away and try and enjoy the last few days of summer. The backcountry has also had it’s fare share of foot traffic but the next few weeks should see many anglersÂ hang their rod up for another seasonÂ especially as conditions get cooler. 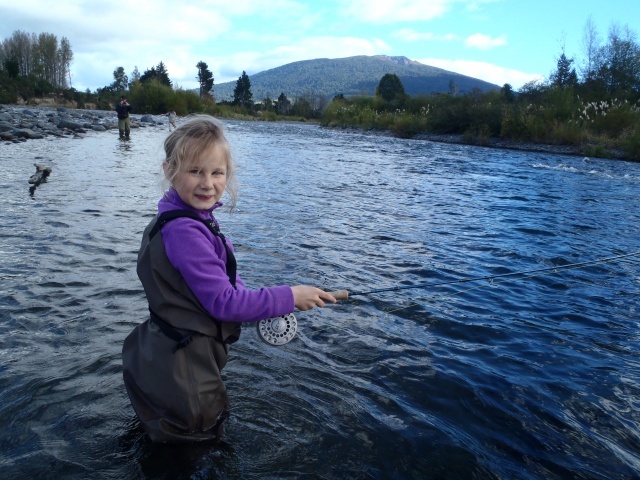 Other anglers will surely be getting their rod down as the coolerÂ conditions will be encouraging good numbers of fish into local Taupo rivers over the next few months. We all have high expectationsÂ for this seasons spawning fish from lake Taupo, I have a feeling we are in for pretty good results condition wise. I have found most rivers in Taupo difficuilt this Easter due to very low water, quite a few anglers and few fish running the river early. There are some fantastic brown trout still being seen and indeed being caught in the Tongariro but they are getting hard to catch especially later in the day once they have seen 2 or 3 rods. Fresh rainbows are hard to findÂ but are in good condition and are fighting well when you do, secret must be to keep moving and cover the water with different methods. 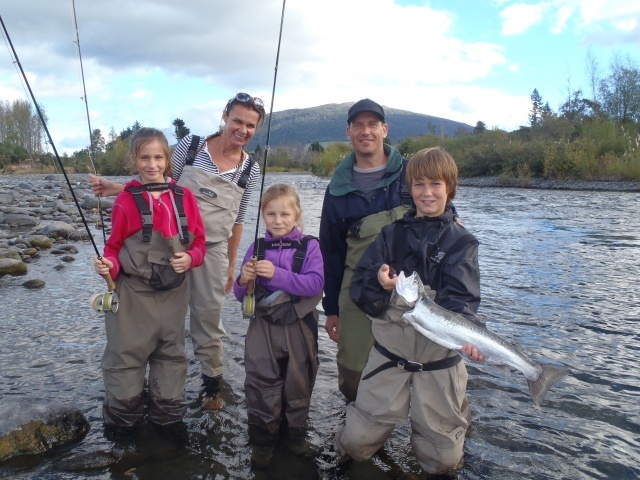 I must admit I have had some harder jobs lately than I usually take on but I really find it hard to say no to enthusiastic young families which just want to experience New Zealand and in particular fly fishing on the Tongariro. Over Easter I went out with the Schram family which were here on holiday from Hong Kong. The Schram’s were a family of 5 with threeÂ kidsÂ as young as 6 and as old as 11. An impossible job, ridiculous even a mission to just get them in waders but with low expectations and plenty of enthusiasm we squeezed them in waders and got them all in the same pool each with a fishing pole. As you can see from the couple of pics we got from theÂ outing it was about the kids, the waders, the scenery, the experience, saving my rods from destructionÂ and the laughs they will rememberÂ when they get home to Hong Kong, we even were lucky enough to get a silver fish and I’m sure it was enjoyed by tired kids that night. This is what Easter family holidays are all about and I’m glad I spent the afternoon with them on the Tongariro. The last I heard the Waitahanui was still producing the better rainbows with most anglers seeing or tangling with one most outings. With the moon becoming smaller every night at the moment the mouth should start to fish again with theÂ darker nights being the best and hopefullyÂ a few will get through and into the river. Ofcourse there are still good browns in this river alsoÂ but can be as stubborn ss the rest of themÂ in other rivers. I went for a walk up the Waiotaka last week from the road to the ford and found quite a few good browns and small rainbows holding up in the deeper pools. The river was extremelyÂ low and fish were crazy flighty and I caught nothing. I had my fly in the trees, the long grass, the back of my jacket and in logs, pretty much everywhere but in a trouts mouth!! A challenging river at this time of year but one to keepÂ your eye on in the next few months leading up to winter especially after a good rain as spawning fish will fill the deeper water on this creek sized river. I like to see anglers using these smaller rivers and being seenÂ enjoying them as they can be very good for the right bunch of blokes.